The NAS battery fire that occurred in September 2011 was an event that shocked NGK. Putting safety and security first, we immediately asked all NAS battery customers to halt operations and quickly started investigating the cause and considering response measures in accordance with the company president’s instructions. We were able to identify the problem, instituted stronger safety measures, and allowed operations to resume. This event also provided the impetus for us to review our basic design from the ground up, and we learned the valuable lesson that we needed product designs and testing systems that would prevent worst-case situations from occurring. It was early in the morning of September 21, 2011, that a report of an accident came in. We were told that an NAS battery installed at a customer’s site was in flames. Members of the Sales Dept. and NAS Battery Division were incredulous as they headed to the scene. When they arrived, the fire was still raging. It gradually subsided, and the fire department confirmed it to be completely extinguished on October 5. Members of the NAS Battery Division couldn’t believe it. A similar fire had occurred a year and a half earlier, but in that case, it involved a special, high-output battery type. However, this incident involved the standard battery type, and it was thought that a fire could not occur in principle. The fact that an interdepartmental accident investigation committee that included Head Office sections as well as managers from every division — not just the NAS Battery Division — was set up the same day of the fire speaks to the magnitude of that shock. The committee was involved in ascertaining the situation, seeking the cause of the accident, and asking all customers using the batteries to halt operations. Production was also interrupted, of course. The Company-wide Quality Council was organized in order to investigate a variety of technical issues, including the cause of the fire and recurrence prevention. Still, almost the entire NAS battery at the site of the fire had been burnt up, and the only clue they had was the data recorded immediately prior. Therefore, the only course of action was to recreate the circumstances that led to the accident, perform tests, and verify, and with both internal and external cooperation, they were able to get to the bottom of it. The conclusion they arrived at was the following estimate: “A localized high temperature occurred due to a clearance malfunction in a single battery cell, causing that one battery cell to rupture. This caused a short circuit to occur inside the modular battery, causing multiple battery cells to rupture, and the entire modular battery caught fire.” The conclusion of the investigation committee was that either a manufacturing flaw or initial defect caused the fire. On that basis, while we proceeded with safety precautions for products already installed, we also took specific measures for increasing remote monitoring and how to respond to fires. We also enhanced our quality management for the manufacturing process, including the introduction of inspections for all products during the battery cell assembly process. In addition to the hard work of employees not only in the NAS Battery Division but across the company, we received support from our customers and experts outside the company. We identified the cause and established stronger safety measures in spring of 2012, about half a year after the incident, and operation of installed NAS batteries resumed in July. Battery production was then able to resume at the end of 2012, with an improved manufacturing process and inspection process. 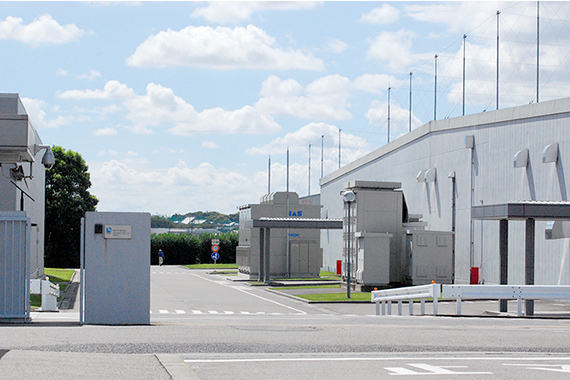 NAS plant where investigation into the fire occurred, and where production resumed on June 2012. 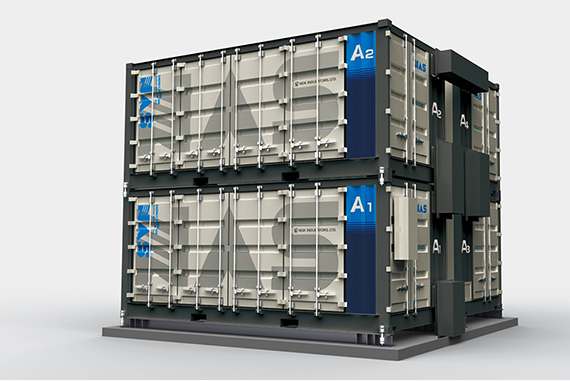 In 2013, NGK announced containerized NAS batteries that were developed after the basic design was reconsidered.